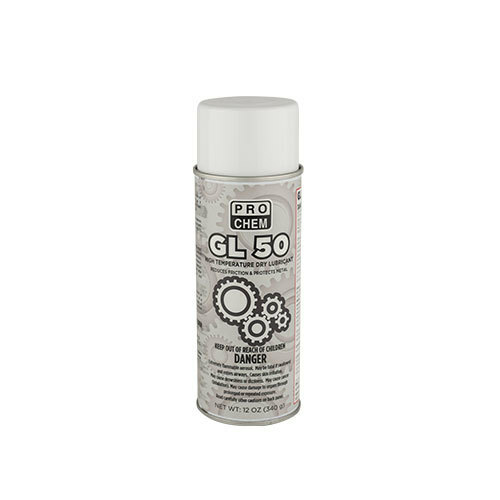 GL 50 | Pro Chem, Inc.
GL 50 is a high-grade, dry-film graphite lubricant that protects and lubricates moving parts on equipment. It protects against rust and corrosion as it eliminates squeaking from tools, hardware and accessories. GL 50 hardens to a tough, long-lasting, tack-free film. Shake well before using. Hold nozzle 6 – 8 inches from surface requiring lubrication. Generously apply to surface requiring lubrication. Reapply as necessary to maintain lubrication level. Note: Clean nozzle after each use by inverting can and spraying.